The right side of Main Street USA has two stops on our tour. The first stop is to load up on some sweets from the Main Street Confectionery. These portable snacks can be used to get us through the hunger pains between each stop. The next stop on Main Street is at the Plaza Ice Cream Parlor to pick up an Ice Cream Sandwich. It’s a good filling snack to start our snack tour. Two warm chocolate chip cookies with the ice cream of your choice in the middle. For the snack tour’s sake, I’ll go with vanilla ice cream. 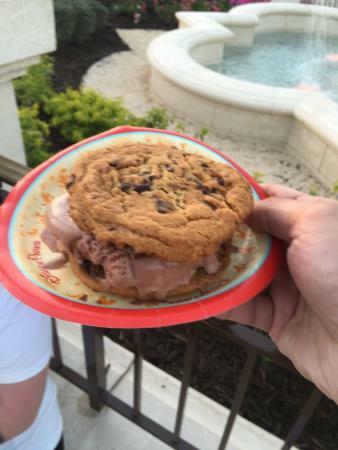 As we make the right turn into Tomorrowland, we will take some time to let our ice cream sandwich settle and digest. A visit to the Monsters Laugh Floor and a couple of tours on The Peoplemover should do the trick. Tomorrowland does not have much in the way of unique Disney snacks. But they do I have a classic Disney snack….The Mickey-shaped pretzel. While we are finishing our Mickey-shaped pretzel, we will head to the new section of Fantasyland. Like our ice cream sandwich, we need some settling time for the pretzel. 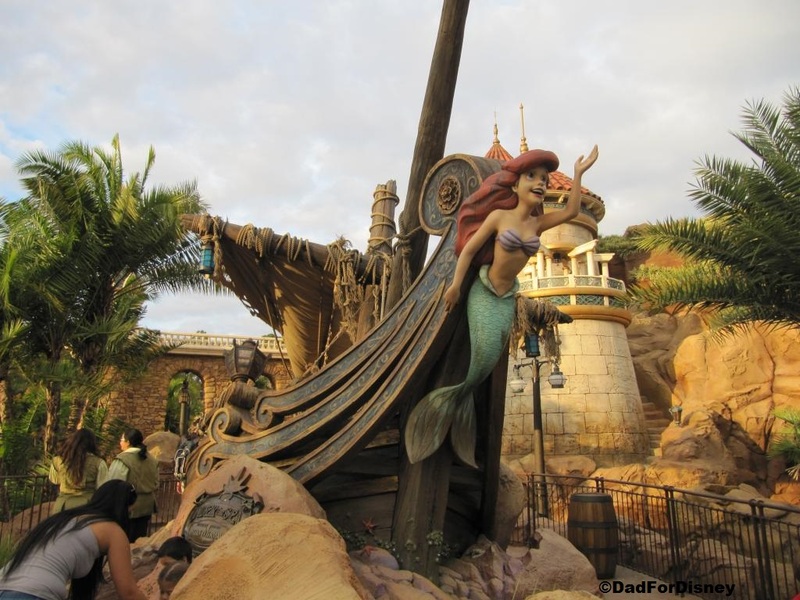 Let’s Journey Under the Sea with Ariel. 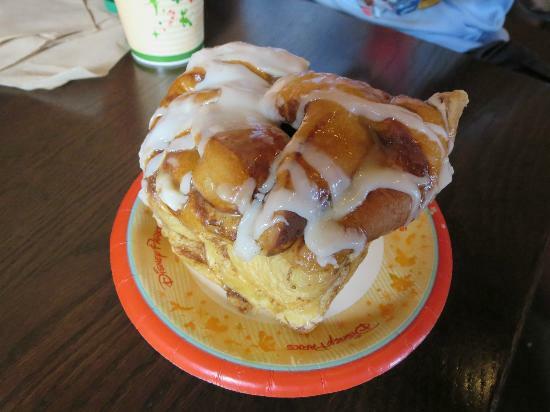 After we return to the surface, we end over to Gaston’s Tavern for quite possibly the most filling snack on our tour….The Cinnamon Roll. The Cinnamon Roll is more like a cinnamon loaf than a cinnamon roll. Maybe Gaston used some leftover eggs to create the large rolls that they serve here. Enough cinnamon roll to feed an entire family. As they roll us out of Gaston’s Tavern, we continue through Fantasyland and head into the classic section of Fantasyland. Here lies one of Disney more unique snack items…..the Cheshire Cake Cup from the Cheshire Cafe stand. These cake cups have appeared in various flavors over the last 18 months. The cake cup that I would have gone for is the Strawberry Shortcake Cup. Closest thing, I can find in Magic Kingdom, to the Strawberry Shortcake cupcake from Be Our Guest. Again, we need to let our food settle while in the classic section of Fantasyland. Like in Tomorrowland, we will see a show and go on attraction. We will stop in to watch Mickey’s Philaharmagic and cruise around It’s A Small World before continuing our adventure into Liberty Square. In Liberty Square, we stop at Sleepy Hollow to pick up a funnel cake before going into Hall of Presidents and trying not to fall asleep from the sugar crash we are trying to avoid. We make it through the Hall of Presidents show WITHOUT FALLING ASLEEP! On to Frontierland! 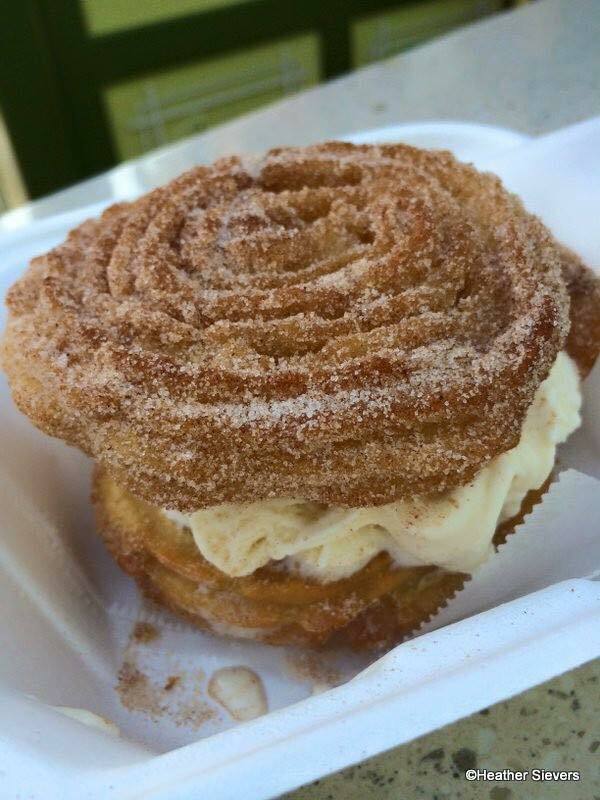 Once in Frontierland, we make a bee-line for the churro cart to grab a churro and wish that we could be in Disneyland and enjoy the churro ice cream sandwich instead. Where do we go in Frontierland to let our snacks settle…..Country Bear Jamboree. After the show, we walk past the Golden Oak Outpost and see that it is closed for the day 😦 No waffle fries for us. That gives us more time to get to Aloha Isle and the Citrus Swirl stand for a yummy Citrus Swirl. Why wait in the long line for a Dole Whip when you can have a Citrus Swirl with half the wait. After our Citrus Swirl, it’s on to the Jungle Cruise to learn about the mysterious back side of water. After our cruise, we hit our final stop on the tour. Casey’s Hot Dog Stand. It sounds more like a lunch or dinner stop than a snack stop but it does have one bona fide, traditional snack on the menu….Cracker Jacks. We grab our box of Cracker Jacks as we walk down Main Street and exit the Magic Kingdom and let the sugar crash commence when we get back our resort.